Considered one of the best and hardest working bands in Wales, Celtic Pride returns with their second album, Light Up the Sky. It's crackin' good one, too. 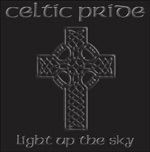 Celtic Pride:: Light Up the Sky official video. Celtic Pride knows how to deliver really big hard rock songs, the kind that rattle stadiums. Big guitars, and bigger riffage and solos, combined with one of the most assertive and steady rhythm sections propel their sound. These are wrapped up in good arrangements that deliver melody and clever hooks, with Justin Matthews vocals having just enough soaring edge to send the tunes to the top. Frankly, Light Up the Sky simply sounds good; this catchy hard rock delivered with nearly pristine precision, while never losing its grittiness. Light Up the Sky, The Patriot (featuring Adrian Smith), and Voices in My Head are large and assertive, catchy and crafty, rock songs that blister and burn. Even the rock ballad Shine on the World has unconventional boldness, with bravado mixed with passion. Fundamentally, all this is to say that Celtic Pride is a very good rock band, suitable for the sweat and sawdust of your local tavern as Bar Room Brawl would suggest. My only hesitation may come with Don't Cry, a nice song but not all that gripping. Otherwise, Celtic Pride's Light Up the Sky is rather epic and entertaining stuff. Easily recommended. Celtic Pride are real hard rock craftsmanship, delivering large, assertive, and rumbling melodic rock suitable for rattling stadiums.